Take 2 glasses of water in a vessel. To it add chopped tomatoes, onions, red chilli powder, rasam powder, salt to taste, sugar and haldi. Boil it for 5 to 8 min. Add some water if it reduces. 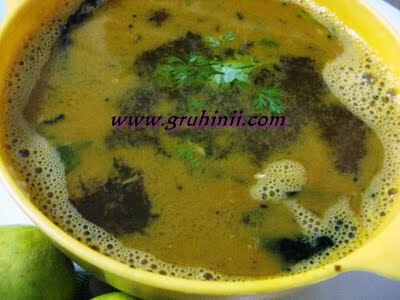 Now heat oil in a pan and add rai, jeera, methi and urad dal. When rai starts spluttering add red chillies, mashed garlic flakes and a pinch of hing to it. Fry for a while and add curry leaves. 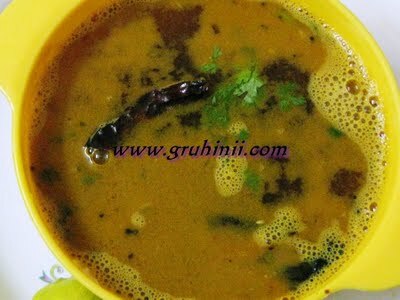 Stir fry and add the thadka to the boiled rasam. 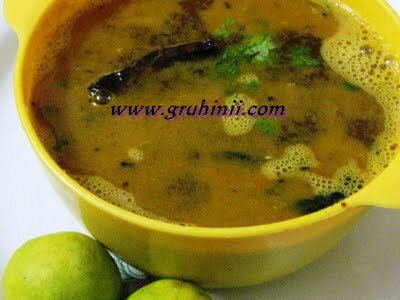 Take the rasam into a bowl and add lemon juice to it and mix well.